During the weekdays, my breakfasts are simple and fast, and often eaten in snatched bites as I finish getting ready for work. Oatmeal or a bowl of cold cereal, sometimes topped with fresh fruit, and water. On the weekends, however, I get to cook something fun. One of my favorite easy savory weekend breakfasts is chopped hard chorizo pan fried, diced potatoes pan fried in the flavorful oil left behind by the chorizo, and a fried egg. But I don't always have chorizo on hand. 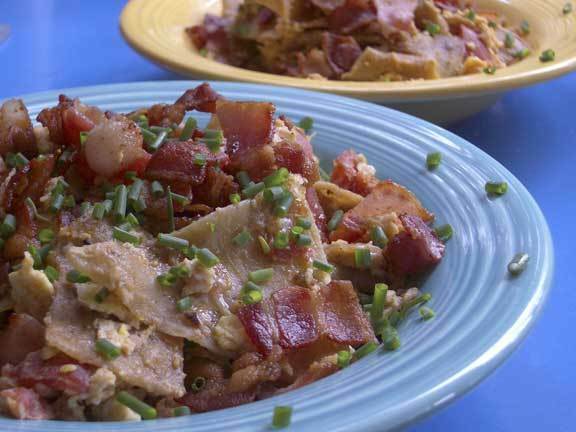 Fortunately, this very flexible dish can be made with sausage, diced ham, or ground pork. This morning, I used ground pork seasoned with chorizo sausage seasoning, ancho chili powder, and whole coriander and a touch of cayenne to add more heat, but you can use any number of different seasonings such as regular chili powder or for a smoky flavor chipotle chilie powder. Don't want a Southwest theme? What about diced ham with sage and garlic? The possibilities are endless. I don't have amounts or even exact spice suggestions. This is one of those dishes I throw together, and season according to how I want them that day. Potatoes — I use red skin or yukons. Peeled, and diced around 1/2 inch size. spices — if your meat is unseasoned, you'll want to spice it. Examples: chili powder, ancho chili powder, coriander. But you can use whatever combination you enjoy. Peel and chop potatoes in about 1/2 inch size. Soak potatoes in a bowl of cold water to remove excess starch. Chop the chorizo or sausage or ham. If using ground pork, mix with salt and spices. Possible spices are chorizo sausage seasoning, chili powder, coriander seeds. Heat a bit of oil in a saute pan large enough to accommodate your potatoes and meat. Cook your meat but not dry. Remove from pan and leave any flavored oil behind. While the meat is cooking you can drain the potatoes. I like to put the drained potatoes in a clean kitchen towel and shake out excess water. Cook potatoes and crushed garlic in same pan. Add extra oil if necessary. Season with salt and add a bit of extra spices, especially if there wasn't enough spicy oil to flavor them. I like to use ancho chili powder. Cover and cook until done. Periodically press the garlic into and turn potatoes periodically to keep them from sticking to the pan too much, and to get the other sides to crisp up a bit. Want them crispier, then don't cover as that traps moisture. When potatoes are just about done, add meat, stir to mix, taste and correct for seasonings, and set to low to keep warm. Heat pan, preferably non-stick, with a touch of oil. Cook eggs until desired done-ness. I like sunny-side up, but you can cook until set or even flip them to get both sides. I don't usually cook with non-stick pans, but they are fabulous for frying eggs. 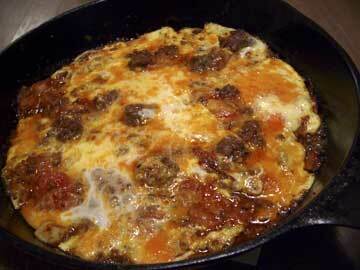 Serve an egg over a serving of potatoes and meat along with some tabasco or your favorite hot sauce. The first time I said to Joe that I was going to make cornmeal mush, he raised an eyebrow and said, "Isn't that a Depression-era dish?" I didn't know about that. Fried cornmeal mush was simply something I grew up eating. But I guess it makes sense. If you have some cornmeal, hot water, salt, a bit of flour, and a bit of grease to fry it in (bacon fat, butter, or oil), then you have cornmeal mush. Simple and inexpensive ingredients. A few days back I realized that I needed to use up my buttermilk before it went bad, and I had also run out of cornmeal. Those two thoughts collided, and the result was this experiment. If basic cornmeal mush was made with water, why couldn't a richer variant be made out of milk or buttermilk? As it turns out, there's not reason why not. The basic cornmeal mush proportion is approximately 4:1 ratio of water to cornmeal. When I added buttermilk, I started with the basic Betty Crocker recipe and substituted buttermilk for only a portion of the water. 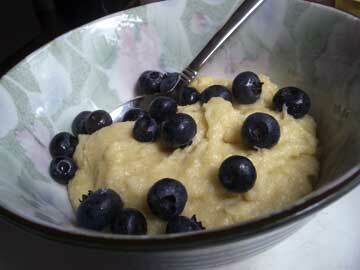 The result is a dense slab of cornmeal mush with the decidedly sour tang of buttermilk. You don't have to use buttermilk. You can use regular milk instead, or even all water. Note: require refrigeration for ~12 hours, so prep the night before you want it. Set some water to boil. A teapot works great for this. Mix the cornmeal and buttermilk in a pot large enough accommodate it all (2 quarts-ish). Whisk in 2.5 cups boiling water and the salt. Cook, stirring constantly, until it thickens and begins to boil (bit bubbles will come up through the mush). Reduce heat to a simmer, cover, and simmer for 10 minutes. Grease a loaf pan. Stir the thickened mush and pour into the loaf pan. Cover with plastic wrap and refrigerate for at least 12 hours. You can unmold the entire loaf of mush or carefully cut slices of the pan. You can cut thick slices or thin ones, depending your preference. Thick slices will have soft centers, and if you use buttermilk, its sour tang will be more noticeable. Thin slices will be crunchier. Dredge the slices in flour. Pan fry in a bit of butter, oil, or bacon fat until crispy. Carefully turn and cook on the other side. Serve with butter (if you like) and maple syrup. Tomorrow is Fat Tuesday, which means it's Paczki Day! I'll be picking up mine tomorrow from Copernicus, which brings theirs in from Canada. If you're ordering 3 dozen or more, you can call them at 734-222-9633 and they'll have them packed up and ready to go; otherwise, just show up at 617 S. Main St., Ann Arbor. Finally, some people are partial to Dom Bakeries. Support a local business and make your co-workers happy, too: buy some paczki tomorrow! A need for buttermilk can lead to new acquaintances. I hadn't planned on a trip to the Farmer's Market today. When I woke this morning, I had it in mind that I would make buttermilk waffles, not only because waffles are a fine thing to make but also because, well, the buttermilk needed to be used. If you know what I mean. And then I'd do some gardening, and some piano practicing, and other stuff around the house. I had my dry ingredients measured, my eggs broken, and the buttermilk... well, it didn't need to be used anymore. If you know what I mean. I thought to myself perhaps I could make a trip into town, swing by the Post Office, get fresh buttermilk at the food co-op, pick up some green onions and tomatoes at the Farmer's Market, and if I was lucky my egg lady would still have some eggs for sale... and just like that, off I was. And because today is Everday Cook's last day, I decided to take a peek inside. I was expecting the line to be out the door — which is why I ate there yesterday, and so I was pleasantly surprised to see just three groups waiting to place their orders and only one of the desserts had been 86'd. Apparently I came in on the tail end of the rush, because the tables were packed. I spotted an empty seat and ask my table mates-to-be if I could join them. This is the kind of town that Ann Arbor is: in line waiting to place my order, I ran into Heather O'Neal, and then I saw friends Andy and Sheila, and then my table-mates turned out to be Christine of Holy Basil and her husband Pierre. Christine and Pierre took a trip to Vietnam last year, and she has been sharing recipes on her blog for the dishes she enjoyed over there. Which reminds me that I'm just a little overdue (by a year!) to share photos and recipes from Joe's and my trip to Morocco. Eventually, I made it home and I even remembered to buy the buttermilk (and Calder non-homogenized "natural" milk - I love non-homogenized). The waffle ingredients were all premeasured, just waiting for the buttermilk. And while a summer storm thundered its way overhead, rattling my cupboards (for real! ), I finally made the waffles, just in time for an afternoon snack. 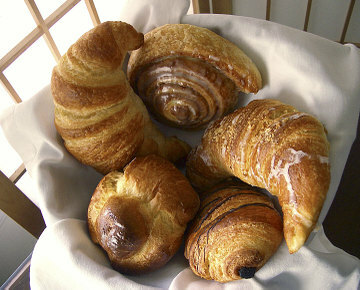 Joe says to me, "We have that stale brioche. I bet it'd make fantastic French toast." And it would. No betting about it. But I didn't really want French toast. I was thinking that buttermilk waffles sounded better. Fresh, hot, with melting butter and syrup pooling in the little squares. Sadly, we were (still are!) out of buttermilk, but that sadness didn't last because being buttermilk-less lead me to the idea of "waffling" the brioche. "Waffling the brioche?" Joe was intrigued. Let me just say if you have a waffle iron and some stale brioche, I can think of nothing more fun to do than reforming your brioche into a crispy waffle grid. And you know what? It's really good! Soak slices of stale brioche (or other bread) in an egg and milk mixture until thoroughly soaked, just like for French toast. Heat waffle iron. Carefully place slices in the iron. You may need to use a spatula to keep the slices from falling apart during the transfer. 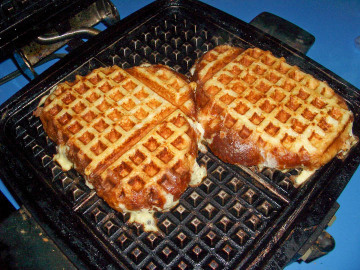 Cook in the waffle iron until brown and crispy (but not dry!). I pressed on the waffle iron lid to make sure that the bread was well imprinted with the waffle grid. Serve with butter and maple syrup. 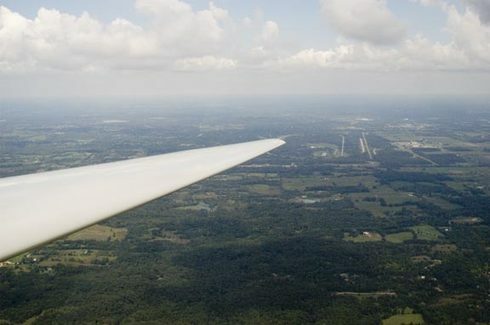 View looking over the left wing of the glider at around 2,600 feet. Last weekend I went up in a glider. It was so exciting that I just had to share, even though it has nothing to do with food. Well, that's not completely true. My friends shared their amazing sandwiches (I must get the recipe) and I shared some blueberry muffins (recipe at end of post). See? I did make it food related. The plane is very small, with absurdly long thin wings. We used a small tractor to tow it down to the end of the grassy runway. At least one person has the "walk the wing" to keep it moving straight. The runway is a former strip of farm land embedded in the middle of a working farm. When I was a child, my mother would dredge slices of cornmeal mush in flour and pan-fry them until they were crispy, and we'd eat it slathered with butter and maple syrup. I thought this was a perfectly ordinary dish well into adulthood until my friends expressed surprise. "A Depression-era dish", some called it. Well, I don't know if it was specifically a Depression Era dish. It was common in the southern and mid-Atlantic States, but not so much in Michigan. It was also apparently common among Italian immigrants. After all, what is fried cornmeal mush but a kind of polenta? And because it was cheap, it was probably common during the Depression Era, too. All I knew, as a kid, was that this fried cornmeal stuff was fabulously tasty, and I always treated it as a special meal. In any event, I have very fond memories of cornmeal mush, so when I saw this creamy maple-flavored polenta recipe in Bon Appétit those old memories of cornmeal and maple sryup quickly had my mouth watering and I knew I had to try it. Right Then and There. And since I had a big bowl of blueberries in my fridge, I knew just how I was going dress it up. Whisk cornmeal and water in medium bowl to blend. Gradually add cornmeal mixture, whisking constantly until polenta comes to a boil. Reduce heat and simmer until polenta is very thick, stirring occasionally. About 10 minutes. Mix in maple syrup and butter. Serve immediately if you want a mushier polenta, or you can let it stand to set a bit. Diana recommends it as a side-dish or for breakfast. In spite of the maple syrup, this is not an especially sweet dish. If serving for breakfast, I would add a bit of extra maple syrup to sweeten it up. Blueberries were perfect in this dish, both for the flavor and the beautiful gold and blue combination it made with the polenta (hey, I went to Michigan...). 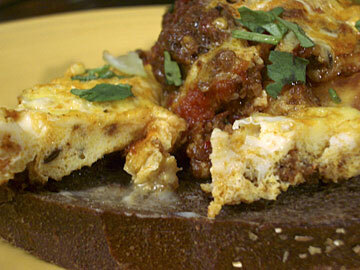 Joe added slices of browned Italian sausage to his, for more protein and a tasty savory combination. When I'm feeling ambitious I make huevos motuleños*, but when I want my breakfast fast I make chilaquiles. This is one of my favorite breakfasts. It's easy, and the variations are endless. All amounts are approximate. Adjust to your tastes. 2 lg peeled and diced tomato (or a cup scoop of canned, diced tomato). Add more if you like. Saute tortillas in butter/vegetable oil until mostly crisp. Add onion and saute a bit to soften. Add tomatoes and simmer 1-2 minutes. Add eggs. Season with salt and pepper. Scramble slowly until eggs are finished to your liking. (I like mine a bit wet.) You can add cheese, if you like. Garnish with chopped chives, or chopped cilantro. I often add diced bacon. I chop the bacon before cooking and fry it up in a separate pan to minimize the bacon fat in the final dish. I don't like my bacon fat to overpower the flavors of the tomato and tortillas. Or sometimes I add black beans or chorizo. *You see, with huevos motuleños there's the fried eggs, and the fried tortillas, and the sauce, and the beans, and ham and peas... And I make two-layer motulenos, so there's food stacking involved. Well, as you can see, it's a bit of work and my stovetop is a mess when I'm done. But they sure are delicious. I'll have to post them sometime.